The last thing I expected when I shared the Tidal link was a comment that it was “Too soon” and as such distasteful. All I was saying in posting, was that the best way to respect the man was to respect how he controlled his legacy. If you’re going to listen to streamed music of Prince use his designated choice! @Tidalwifi is the only place you can listen to all Prince’s Music – Why not honor what he stood for by supporting this service. Last December, Prince removed his music from all other streaming services, telling Ebony: “The catalog has to be protected. ” All of Prince’s classic albums are on Tidal, including “1999,” “Purple Rain,” and the 1989 Batman soundtrack. We’re uncomfortable with death, We’ve even more uncomfortable with the notion of profit after the death of a celebrity. Yet the lesson I have learned from prince was the importance of Valuing your work. That and creative integrity. I always marvelled at the fact that he did not just say something he took a stand and lived by his conviction. not only did he fight for his catalog. he placed it where he believed it would do more good. Prince’s albums would have done well wherever they were placed. Yet he chose TIDAl. People are going to stream his music, i simply believe the best way to honor him is to respect the choice. Yet when I shared this on Fb groups I was met with “Too Soon”! Note I am Not profiting from this. However within many cultures the idea of artist and profit, the idea of death and sales is TABOO! 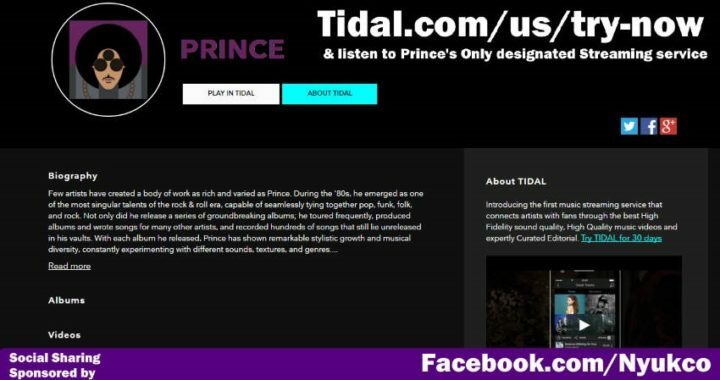 Prince owned his creativity… Owned his music, he also placed that music on another site to be streamed. He could have easily developed his own solution. However, he knew his strengths and his limits. Ownership does not mean poor decisions nor does it mean total control. My hope is that somewhere in subsequent days, we can dissect and learn not only lessons on Creative ownership but also on LEGACY from the Purple Prince!